Once again I am ending the year in the midst of a Bonnie Hunter mystery. When will I learn? I made absolutely NO progress last week, what with holiday shopping, activities and such. I have to admit, though, that my attention has been diverted by what could become a new obsession: Patchwork of the Crosses. I'll blame it all on Teresa at A Quilt and a Prayer. Her POTC blocks are so stunning that I just had to try it. It has been well over 10 years since I last did any hand piecing so it took a while for me to remember the techniques. I need to work on the set-in intersections, but I'm getting the hang of it. Here the third round is ready to sew on, and I'm auditioning choices for the 4th round. Any thoughts? One of Teresa's secrets is fussy cutting the elongated hexagons that make up the block. I knew that Cindy Blackberg has a rubber stamp for these so it went on my Amazon wish list. Cindy's stamps are great because they include both the cutting line and the stitching line. But I lay awake at night trying to figure out how I could stamp selected motifs accurately when I couldn't see what I was stamping. Teresa to the rescue again! She told me about a similar CLEAR stamp developed by Marita and available at The Quilter's Path in Mt. Juliet. So on Saturday I made a quick trip to MJ (with a stop at Son-2's house to check out their new hardwood floors). After a quick demo I was in business! I started with some practice fabric to get the hang of fussy stamping. With a water-based fabric ink, simply stamp the back of your fabric, cut out your pieces on the cutting line, then accurately stitch together on the stitching line. I use Fabrico or VersaCraft ink, both manufactured by Tsukineko, Inc. (Don't be fooled by look-alike products -- it has to be an ink that works on fabric!) I hope my arthritic hands will hold up because I really want to have a grab-and-go handwork project ready. Stay tuned to check on my progress. And let me know if you are caught up in POTC blocks, as well. I love seeing what others are doing! I could use some construction hints, too. Hope y'all have a great week and a blessed New Year! ... who'll you run into. My Main Man and I were doing weekly senior shopping at Kroger this morning -- along with everyone else grabbing last-minute things for their holiday meals. After picking up some organic carrots I turned and almost tripped over a lady in an electric cart. She was quite attractive for her age (I'm entitled to say that! ), wearing a hot pink swing coat. From the other side of the produce department I looked back to see how the lady was progressing. 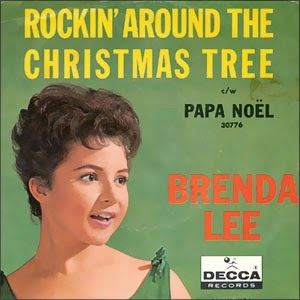 With sounds of "Rocking Around the Christmas Tree" coming from the PA system (or maybe it was "Jingle Bell Rock"), I realized I was looking at Brenda Lee! OK, any youngsters reading this have no idea who I'm talking about. It was her recording on the PA.
Brenda Lee and I are about the same age, give or take a year or two; we grew up in two small suburbs of Nashville in the 60s. It was not unusual to see Brenda at basketball games with her circle of friends -- just an ordinary teen .... well except that she was a singing star, doing concerts in Europe, making records. That's Nashville for you -- stars live in our midst and we give them their space. I worry that with all the recent focus on the attraction of Nashville that the paparazzi will make it harder to see our beloved stars in public. I hope it doesn't change. 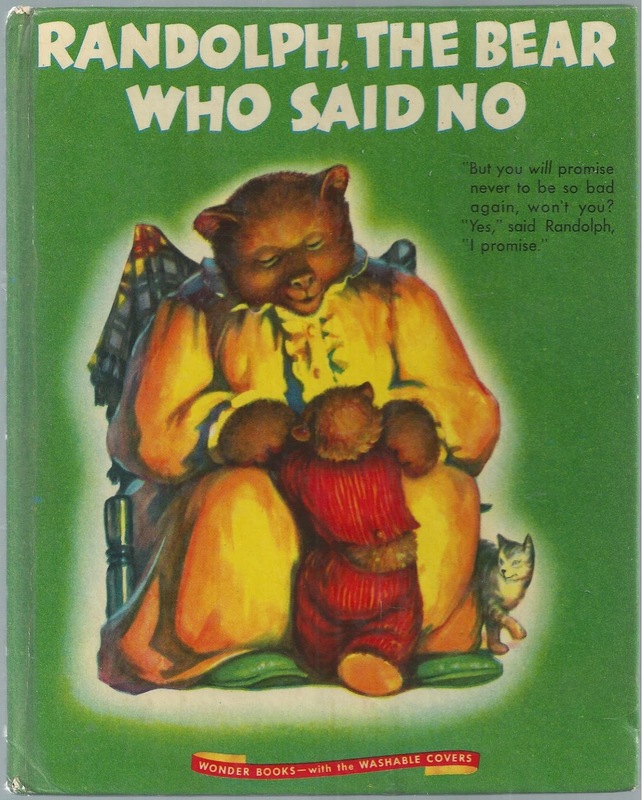 One of my favorite Wonder Books when I was a child was Randolph, The Bear Who Said No by Faith Nelson. It is a moral story about a bad little bear whose automatic response was "no." So a fairy casts a spell such that he cannot say anything else. Do you want ice cream? "No." Do you want to play outside? "No." You can imagine the frustration that developed. For the life of me, I don't remember how he managed to get the spell removed, but that book taught me you should always be careful of what you say! Why I am bringing this up right now? Today the Queen Mother (my invalid MIL) was Randolph! Ordinarily she is very non-responsive. She has a difficult time processing questions and rarely comments on anything. But every once in a while the wiring connects and she becomes Chatty Cathy. And often, when she's in that mode, she says "No" to everything. She will stay like this for about 36 hours and then crash for another 36. God bless the caregivers who put up with her through thick and thin. Today she was Randolph. And all we can do is laugh. It's hard to say which Mother we'd rather have, quite frankly. I wish she were still the lively, thoughtful, creative, artistic mother my Main Man grew up with. But that will never be. We do our best to keep her comfortable and healthy. Every year we think it will be her last Christmas, but the Eveready Bunny fools us. Christmas traditions came to be? Sunday the leader of our church children's programs talked about her family's tradition of eating fish on Christmas Eve. That's a new one on me. But it got me thinking about our family's Christmas Eve tradition when I was growing up: vegetable soup! For many years the fundraiser for the Nashville home for unwed mothers was caroling on Christmas Eve. "A candle in your window, a carol at your door." Each year the Scout troops in our little community spread out over the town, caroling and collecting coins door to door. Afterward we assembled at the Methodist church to warm up with hot chocolate and turn in our collections. One year my mother (a/k/a The Mama) was in charge of the event which overlapped the dinner hour. So to make life easy for herself she made a big pot of vegetable soup in the deepwell burner on our stove (pre-crockpot days). It was delicious. The next year, when she was no longer coordinator of the caroling, she asked my brothers what they would like for Christmas Eve dinner. Their response: "We ALWAYS have vegetable soup on Christmas Eve!" A tradition was born, one that I carried into my own family while Son-1 and Son-2 were still at home. I'm linking up with Connie at Free Motion by the River. Thanks for visiting! Christmas Blessings to everyone. In spite of my previous objections, I caved and decided to do Bonnie Hunter's mystery quilt again this year. She is calling it "Grand Illusion" and clues are revealed each Friday; we are a month into the challenge. 1. I chose my own colors which has presented its own set of problems since I substituted green for aqua, a rusty rose for green, and a taupey dot for the yellow constant. I have to constantly refer to my crib sheet. Otherwise I'm using flesh for pink, " "brack" (a brown that's almost black) for black, and silver gray for neutral--not much different than Bonnie's colors. 2. I'm only making half size to start. That way if I don't like the final reveal I won't have committed a lot of time and fabric. But I've made sure that I'll have enough fabric if I want to make it full size. So, Clue 1 -- broken dishes -- I finished right away, except for the extra half-square triangles that would be used in Clue 4. I actually made a few more than half of the broken dishes units. Clue 2 -- double diamonds -- took a little longer. I'm using Method 2 with the Easy Angle ruler and I'm having very good results. I am 4 units short of completing half of the double diamonds. Clue 3 -- two-by-fours -- should have been easy. Two rows of four 2" squares. First thing I did wrong was make stripsets of brack and silver instead of brack and rose. And no one pointed out when I posted my progress that the brack squares were in the wrong corner! At least I had only made a few to test my rusty rose color! Still need to make 30 to finish half. Clue 3 - 2 x 4s - Oops! Clue 4 -- more broken dishes in two different arrangements. Done! I will try to get a few minutes at the sewing machine every day this week so that I will be totally caught up (half way, that is) when Clue 5 is revealed on Friday. Hop on over to Quiltville's Quips and Snips to see progress around the world. How does a S'more prepare for a retreat? First she assembles the necessary sewing accouterments. Then she makes sure to stay nourished. She brings the proper beverage containers. And, because it's Christmas, she decorates the tree. Linking up with Free Motion on the River for Linky Tuesday. The S'mores held their annual Christmas Party/Retreat last week. You may remember that we are called "S'mores" because we like to laugh s'more, eat s'more, and quilt s'more. And at Christmas we like to gift s'more! Even though we were missing some folks with issues of concern, we managed to accomplish a lot in addition to supporting each other through crises. I had high hopes of slaying two dinosaurs -- both pink and brown and both hanging around since that color combo was the rage several years ago. First is a medallion quilt that I began at Gwen Marston's Beaver Island Retreat (which is no longer held on Beaver Island, BTW, and has been taken over by the Holly Sisters) about 10 years ago. I was a relatively new quilter with a limited collection of fabric, trying to make something look mid-19th century. Also, I hadn't quite honed in on an accurate 1/4" at that point. I sort of cheated by beginning with a toile-style panel -- I think by In the Beginning -- and got 5 rounds on it. The 4-patches on point were to be the next round but I think proportionately it's too clunky plus I can't figure out how I planned to make the corners work. I think I am going to scrap the 4-patches -- well, not really; I'll use them in something, maybe a strippy -- and do a graduated log border (don't know any other way to describe it) in the same brown as the 5th round you can see at the bottom. And call it done. Or maybe it will say it needs something more (but I hope not!). Regardless, I couldn't make the math work in my frazzled brain so it went back in the box. The second one is a strippy of flying geese separated by this spectacular fabric by Jo Morton/Andover Fabrics. Again, started before I appreciated the wonders of an accurate quarter inch or recognized the hazards of sewing on more than one machine. My strips of geese were not all the same length. They should have measured 81.5". So I cut the separator strips at 81.5" only to discover that the geese measured 82.5". To make a long story short, I shortened the geese strips by one, adjusted a few seams and managed to make everything fit, but it took me the better part of two days to work this out. With the little time I had left I worked on Clue 2 of Grand Illusion. I am using Method 2 with the Easy Angle Ruler. I am having good results and there is virtually no waste. Y'all must think I'm more wishy-washy than Charlie Brown. Unfortunately, it's a gloomy day and my camera has not accurately captured the colors. Essentially I'm taking the colors from the dots on the taupe background which actually looks more gray in this picture. It will replace the constant yellow. Spring green replaces aqua, flesh replaces pink, "brack" (a brown so dark it's almost black) replaces black, and silver gray (not shown) replaces neutral. I think green in Bonnie's scheme will be replaced with a rosy rust (or maybe a rusty rose), but I'm waiting to see how green will be used before chosing the actual replacement color. My fabric palette is very limited because I am determined to use fabric from my stash. Only the dot is newly purchased fabric. Overall I think the palette is very serene and I'm trying to pick my most "modern" fabrics to play along. My plan is to attack half of each clue as it comes out and then, if I like the final reveal, I will make it larger. I'm still thinking about which way I want to do Clue 2, but I have the 2-1/2" strips cut and packed to go with me to retreat tomorrow. Hop on over to Quiltville's Quips and Snips to see what other folks have accomplished. It's a world-wide phenomenon. ... the view from our retirement property? We have our fingers crossed, waiting on some final information before making an offer. I frequently slip my shoes off under the dinner table, under the computer desk, at the kitchen bar, under the edge of the bed. I'm constantly looking for my shoes. I'd rather go barefooted, but the tile in the basement gets quite cold this time of year. One day recently, around 3 p.m., I looked down at my feet..... You'd think I would have noticed! I finally got the camera and the computer in the same room so I can reprise our Thanksgiving with Son-2, et al. First, the brined bird got a good rinse and a pat down. The final result -- delicious! Followed by a family walk in the nature preserve -- invigorating! I forgot to update my numbers after my shop-local-Saturday trip to Hancock Fabrics and Hobby Lobby. There were a lot of bolt ends with thirds and such; in all I think it totaled about 16 yards.